Stay in this breathtaking, impeccably furnished, clean and modern apartment where every surface glimmers. 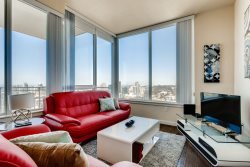 Bright and airy 2 bedroom with 2 sparkling marble bathrooms and an in-unit washer/dryer. Enjoy your very own private balcony and abundant closet space. Kitchen has all new appliances and is fully stocked with everything you need to feel right at home. Central AC and heat throughout the apartment. Incredible building that offers peaceful and quiet with all the amenities you need. Beautiful courtyard pool, stunning rooftop lounge with a barbecue set. Enjoy a 24 hour a fully equipped gym and a conference room. Private parking conveniently located in building garage, and included in the rental.